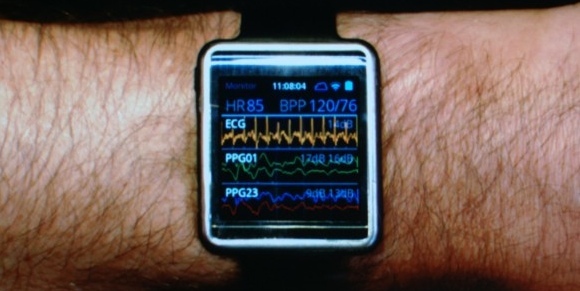 Ahead of the upcoming debut of iOS 8, which is expected to include Apple's "Healthbook" health aggregating platform, Samsung has announced its own health tracking platform that envelops both open modular hardware and a cloud storage solution. Called SAMI (Samsung Architecture Multimodal Interactions), the company's cloud-based sensor data platform is designed to be entirely open to developers and "complementary" with Samsung's S Health initiative. Alongside SAMI, Samsung showed off its Simband, a reference device that includes a multitude of wearable sensors with several different health-tracking functions. Designed to be an open reference sensor module, Simband offers the standard accelerometers to measure movement along with an ECG sensor and a sensor that measures skin temperature. The device, which offers miniaturized electronics along with Bluetooth and WiFi, also shows off a removable "shuttle battery" that clips into the band to charge it while it's being worn. As described, the battery allows the device to be worn 24/7, snapping in to charge it during sleep. The open device is multimodal and designed to be customized with interchangeable components, allowing hardware developers to create their own hardware able to be attached to the band. Samsung's cloud platform SAMI is designed to collect "any kind of data" from a range of devices. On stage, the platform was likened to a bank, storing and securing data privately. Samsung president Young Sohn compared the company's health efforts to a car dashboard for the human body, aimed at giving consumers an overall picture of their wellbeing. Simband and SAMI are both open and available to developers, and Samsung has paired with early partners like PhysIQ and UCSF to develop new wearable hardware. Developers will be given access to the SAMI SDK later this year. The company also announced a $50 million digital health challenge aimed at creating new sensors and new health-related technology. If only Apple would rumor that they intend to come out with a cure for cancer, every other phone/electronics company would try to beat Apple to market with the cure. Amazing how a mere inkling from Apple can drive the competition. SAMI: the perfect example of an acronym who's words were chosen for the sake of the acronym. So basically Samsung is saying pick us over Google. And at the same time making sure they can say first! before Apple announces anything next Monday. Reminds me a little bit like when Google scheduled a maps event right before WWDC in 2012. I can't believe an entire company exists just to be the hardware equivalent of the internet 'First !' meme. He then added, "And once we have a better idea of what Apple's doing with CarPlay, we'll release an actual car dashboard too." This would be useful in a hospital or as an outpatient tool. But for the life of me, I cannot think of a reason the general populous would want to constantly monitor their current health. I see this leading to lots and lots of cases of hypochondria. "Oh no! My BP is 10 points higher than normal!" The stress of worrying about high blood pressure causes blood pressure to increase some more. Ack! Vicious circle. LOL, they call their new product SAMI. Ironically I call Samsung "Sammy". I'm sure Sammy created the SAMI name on purpose to represent their company.